The new college intranet, which is replacing KnowHope, is now live and available! The new service is called inHope, and can be accessed at in.hope.edu. It is only accessible to individuals who have a hope.edu email account. Features of inHope include: mobile friendly, easy to scan/filter, common links, easy to submit announcements, today’s events calendar, featured news, academic calendar, people search, blog posts, Instagram photos, a survey of the week and more! Links: quick access to all of the common links, resources and services you use on a regular basis can be found in the orange navigation bar at the top. Hover over “Resources” to see links for Resources (commonly accessed items), Services (forms and requests), and Safety (emergency guide, incident reports, etc). Announcements: tagged announcements can be viewed by clicking the announcement title. A new streamlined submission form makes it easier to submit announcements, which allows you to determine how long you want your announcement to stay on the site. Announcements should include information that pertains to the majority of campus and is not an event (unless you’re previewing your event in advance) and not something already covered in an official press release. Featured Story: most days a new item will appear highlighting a big story for the day (news story, blog post, big event, campus photo, etc). Today’s Events: will always show all events happening today. This is showing a direct feed from our campus web calendar. View instructions for submitting an event to the events calendar. Take Note: these boxes will feature various content that is important to take note and may have a longer shelf life than an announcement. Academic Calendar: this will pull a direct feed of the Academic Calendar via a Google Calendar maintained by the Registrar’s Office. You can also subscribe to it and add it to your own Google Calendar. People Search: Employee Search and Student Search both pull the same information as KnowHope People Search did, but now is a filter instead of a search, which returns even quicker results. Employees can be searched by name or by department as well as sorted. Other Services: you’ll also find updated versions of Marketplace, Ride Exchange, Incident Reports and (coming soon) Minutes and Agendas. More: also explore blog posts, Instagram photos, and a fun survey of the week sponsored by the Frost Center! Questions or suggestions? Contact us at inhope@hope.edu. Many of us have relied on KnowHope for our daily information during much of the site’s existence, which premiered in 1996. We’re excited to announce that we’ve been working on a “new KnowHope” to serve as the next generation of our college intranet. It will feature a new name and design, offer new functionality, and introduce a streamlined process for submitting information. We’re planning to launch this refreshed service to coincide with the new academic year, but we would like to give you a sneak peek of the new site before it goes live. You’re invited to a “new KnowHope” presentation this Thursday August 18 at 10am in the DeWitt Center Herrick Room. Refreshments will be provided. We look forward to launching this improved site for our faculty, staff and students and hearing your feedback! Congratulations to the Van Wylen Library on the launch of their new beautiful website, hope.edu/library. If you’re interested in learning more, our friend Jon Bandstra at the Library has published a great blog post about the new site and its updates. Check it out! If you guys are anything like me, you’ve never really paid a ton of attention to the Hope website. In fact, as a freshman (three whole years ago now!) I found myself getting confused between KnowHope, KnowHope Plus, and the regular Hope website because they all looked so incredibly similar to me. But within the last year or so, the Hope site has been slowly undergoing a huge makeover. As an intern for the Office of Public Affairs and Marketing, I’ve watched the website go from slightly dated and difficult to navigate to a modern and helpful space for students to get the information they need. Because the old design was a bit more challenging to surf through, I was unaware of all the amazing features our site already had, as well as the new additions that make it even more connected to the student body. One of my favorite things about the new site is the news section. Essentially the News section is one big calendar that posts various press releases about campus happenings, as well as features students’ Instagram, Twitter and blog posts about the college. It’s shocking to me how many students don’t even realize their posts are featured on the site, simply because they’re unaware of what the News section is. We try and feature as many different students and student groups as possible, so you never know who you may see on the site! It’s a fun and unique way to open the communication door between students and the college. Another feature that has become a lot more student-friendly is the events section of the home page. This section not only lays out all the upcoming events for the week, but also provides a photo of the building where the event will take place. This works to benefit prospective students, who may not know where, say, Lubbers Hall is. It also reminds current students of the many opportunities for learning and growth that Hope continually offers. These are just a couple of the features our new site boasts, and the more I navigate through the site, the more I find. I recommend students of all kinds, whether prospective, underclassman, or upcoming seniors, to spend some time on the site and become familiar with all it has to offer. You never know when it may come in handy! What’s so newsworthy about new employee photos? We take new photos every August, right!? Well, for 2016 we decided to shake things up a bit. For several years, our employee photos have been done in a consistent style. The background featured familiar “clouds” in natural hues and a vignette framed a closely cropped smiling face. 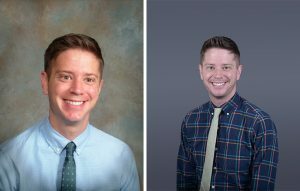 Since our rebranding a few years ago and the launch of the new web site last fall, it seemed time to refresh the style of the faculty and staff photos, as well! We partnered with Jon Lundstrom of Junebug Photography for the makeover. A more modern gray backdrop, friendly pose and catchlights make for an engaging image. Additionally, we’re shooting these photos so we can see more of you — from about the elbow on up. This summer we have scheduled multiple photo sessions for employees so that everyone has the opportunity for an update. All photo sessions take place in the DeWitt Center Lounge from 8:30 a.m. – 4:30 p.m. Bring your smile and join us! The provider of our OU Campus CMS, OmniUpdate, recently featured Hope College in a new case study. 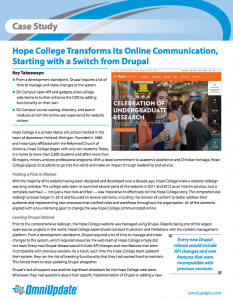 Read about how we put together a plan, built a foundation for change using user personas, enhanced the user experience and are now fulfilling our vision for changing the way Hope College communicates online. OmniUpdate also previously produced a video testimonial about Hope College late last year.